I've outgrown the rides too. My stomach can't handle the spins. But, it's still fun to see the lights and hear the screams. Our county is agricultural, and the farmers always bring cows and other animals. 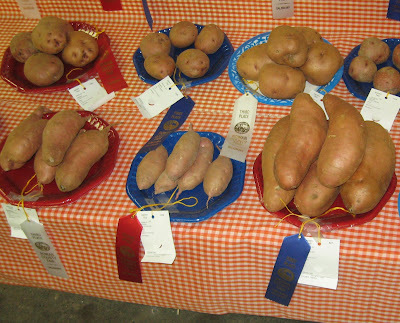 The exhibits are fun at the county fair. Farmers bring in crops. There are canned goods, art, flowers and even hand made clothing. If you've never been to a county fair, you should check one out. They really are a lot of fun. 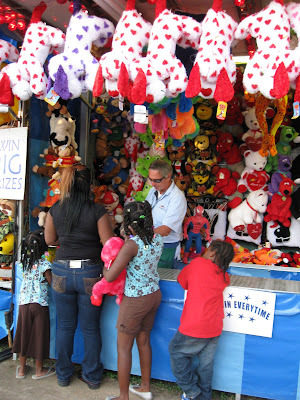 There are carnival rides and games but also lots of contests and exhibits. 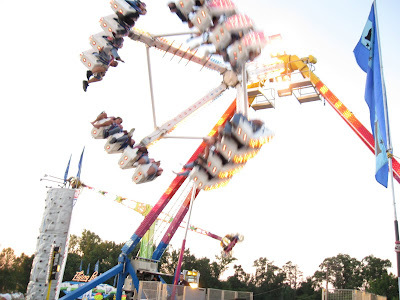 You can also find some great food at county fairs ranging from the traditional carnival food fare like funnel cakes (elephant ears) to local organizations make local favorites like chicken and dumplings. 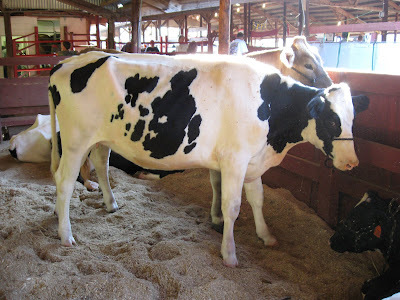 When I was a kid and in 4-H, I always entered things in the county fair. It was fun to win ribbons and a little cash for cookies, crafts and canned goods. I was always scared of the canner, so I never did many canned goods. When the canner would start blowing off steam, I'd run and hide. I still want to do that, so I don't can. I always think it is going to blow up and cover me with hot green beans. Local school kids get free tickets around here. Our school night was always Tuesday. For some reason, it always poured the rain on Tuesday. This year the tickets were were Tuesday, Wednesday, or Thursday, and we actually hit a sunny evening. I kind of missed getting soaked and plodding through the mud. Well, just a little anyway. County fair food is always so yummy. Most of it is not healthy, but it's just one night of the year. I like to try out new foods at the fair and especially any new barbecue booths. I also love to get elephant ears right before we leave. It is a tradition in our family to arrive home covered in powdered sugar and to have to wash and vacuum the car the next day. I used to play the games, but I was never too lucky. My boys seem to have my luck, so they learned (after a few years) that it's simply hard to win anything much. One year I did win a goldfish. I named the goldfish Lucky, so I guess I can't really say I never won anything. It was kind of hard to juggle Lucky and get her home, but she did fine and lived a couple of years. 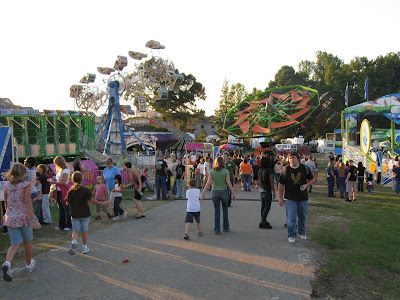 Now that there are so many big amusement parks like Carowinds down the road, the county fairs seem to be a little smaller. Perhaps it's just that I'm bigger. In any case, I really like the small town feel and seeing people I know and not just a lot of strangers waiting in lines and looking bored. The county fair is kind of like one big local party. This year I saw my dentist and his little girl as well as a lady from work and some neighbors. I even made some new friends - like the guy with the traveling barbecue stand. Every year is different but always fun. There are big state fairs. Those are fun too. But, I think it's hard to beat a little county fair. Everything is pretty informal, and it does not take hours and hours and loads of walking and waiting. It's just a good time and a few hours to forget about everything you ought to be doing.